An original WHA team in 1972, the Nordiques joined the NHL in 1979 and, after a rocky debut season, made the playoffs consistently during the 1980s. In the 1990s, the Nordiques had their ups and downs, but they enjoyed strong fan support year in and year out. A big part of the team’s appeal was without doubt the Quebec Nordiques uniform, which stands as a top NHL uniform to this day. The Nordiques jersey has all the hallmarks of a great NHL design: creativity, simplicity and emotional power. Let’s take a look at these elements one by one. Creativity. The primary Nordiques logo is a red hockey stick with a blue puck sitting on top, leaning on a blue-bordered, red N. These elements combine to form an igloo — a neat visual trick indeed. And it’s not only very creative, but also very appropriate: the logo incorporates the game of hockey as well as a hat-tip the Quebec City’s far north location (“Nordiques” can be translated to English as “north men”). Simplicity. 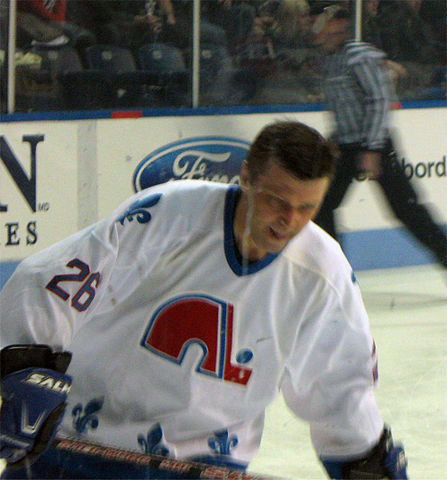 Simple lines and a simple blue, red and white color scheme characterize the Nordiques jersey’s logo. The Nordiques jersey gets even simpler with the secondary logo, the fleur-de-lis, three of which appear at the bottom of the sweater on front and back and on the shoulders. The rest of the sweater is a practically solid blue or white. Emotional power. The primary logo evokes a feeling of being at home in the north and also of no-frills hockey. The fleur-de-lis, the symbol of Quebec province, evokes provincial pride and a sense of tradition. It’s the uniform of a team the home team fans can root for with all their hearts, which is exactly what the Quebec City fans did. The Nordiques jersey, despite being nearly three decades old, looks as though it could have been designed yesterday — the design fits any hockey era to perfection. This is why we selected it as one of our Top 8 uniforms. And we are definitely not alone: The NHL itself named the Nordiques logo as one of the Greatest NHL Logos of All Time. A Comeback for the Nordiques Jersey? Even though the Nordiques were in Quebec for a relatively short time, the team made quite an impression, rising quickly to become a contender, then experiencing an epic drought in which it won only 26 games in a three-season stretch. All the while, it established a ferocious rivalry with that other Quebec-based NHL team, the Montreal Canadiens. And when we say ferocious, we mean ferocious. A 1984 playoff game between the visiting Nordiques and home-ice Canadiens involved what has become known as the Good Friday Massacre, probably the bloodiest brawl ever to occur in an NHL game. Fourteen official fights were recorded, along with 11 ejections and a total assessment of 252 penalty minutes. After the ice shavings settled, the Canadiens ended up winning the game and wrapping up the series, but Nordiques fans could take comfort in knowing that they knocked the starch out of their rivals, who fell to the Islanders in the next round. While the NHL may not be eager to see a repeat of such mayhem, there are indications the league may be open to a new Quebec Nordiques franchise. The Arizona Coyotes continue to struggle in the desert. The league is interested in bringing teams to Canada, as evidenced by the Jets coming to Winnipeg from Atlanta in 2011. Various potential owners have expressed interest in bringing a team to Quebec City in recent years. And despite being a small market by NHL standards, Quebec City is proven to have a solid fan base, and the community has already gone the extra mile to build a new arena, the Centre Videotron, that’s just waiting to host Nordiques hockey. Can a relatively small city support a major professional team? Ask the citizens of Green Bay, Wisconsin.